Rafael Marquez (39-5, 35 KO's) defeated a resilient Israel Vazquez convincingly (44-5, 33 KO's), capturing a 3rd round technical knockout to even the series between them at two fights apiece. Vazquez, 32, opened the bout landing a swift overhand right, although Marquez, 35, landed the sharper punches in round one, striking Vazquez with counter left hooks and overhand rights. Then, Vazquez responded with a left hook to Marquez's head. However, Marquez started using lateral movement and utilized an effective left jab. In round two, Marquez opened up a severe laceration above Vazquez's left eye when he connected with a precise overhand right. After that, Marquez found his range and continually beat Vazquez to the punch, scoring with left uppercuts in close range. Still, Vazquez kept pressuring and fighting through a bloody face. Both men exchanged right hands to start the third round. Marquez landed a quick left uppercut, but clashed heads with Vazquez. As a result, Vazquez sustained another cut above his right eye. Next, Marquez floored a bloodied Vazquez with an overhand right to the head. Vazquez got up, however, he was met with a barrage of lefts and rights from Marquez, prompting referee Raul Caiz Jr. to stop the contest at 1:33 in round three. Marquez wanted to make a bold statement coming into the fight. "I was really hurt," stated Marquez. "Today, I made things clear." Marquez also believes another fight with Vazquez could happen in the near future. Marquez declared, "A fifth one could be a possibility, if the fans want it." 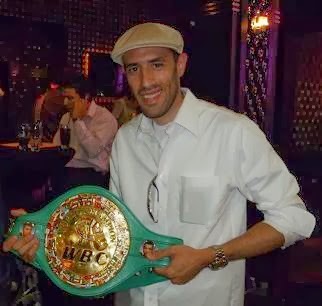 Vazquez expressed his interest in a fifth fight. "I'm willing to do it again in 5 or 6 months," said Vazquez. "Maybe surgery is needed so the cuts don't open again." Prior to tonight's fight, Marquez won the first encounter (RTD 7), while Vazquez prevailed in the second (TKO 6) and third (SD 12) fights. In the co-feature, bantamweights Yonnhy Perez and Abner Mares fought to a 12 round majority draw. Gwen Adair and Eugenia Williams scored the fight 114-114, while Marty Denkin saw it 115-113 in favor of Mares. As a result, Perez retains his IBF bantamweight title. Perez was the aggressor in the second round, although Mares was dictating the pace. Mares placed his punches efficiently, landing left hooks and getting his punches off before Perez. Mares came on strong toward the end of round three, however, it was Perez who landed the cleaner, more effective punches. In round four, Perez struck Mares with numerous rights and left hooks. Mares was not slipping Perez's punches well, and his punch output instantly dropped. As Perez continued to press the action in round five, Mares found himself repeatedly on the defensive. Yet, Mares found his range again in round six, and kept Perez off-balance by moving after connecting with several counter left hooks and swift right hand blows. In the seventh round, Mares started well, but Perez came on strong mid-round. Then, Perez momentarily stunned Mares with a right to the head. After that, Mares started using lateral movement and scoring with right hand shots. Mares landed countless overhand rights and left hooks, while Perez's punch output slightly dropped in round eight. Mares took control of the fight from rounds nine through twelve, hammering Perez with fierce left hooks in close quarters. Perez's punches lost steam in the final rounds, which enabled Mares to land solid rights to the body, followed by a barrage of overhand rights and left hooks. Mares found his range, and Perez simply could not get his punches off fast enough. In the twelfth round, Perez landed a left hook, but Mares quickly countered, landing a left hook before connecting with a stinging left uppercut. Then, Mares staggered Perez with a left-right combination. After that, Perez successfully landed another left hook. Nevertheless, Mares hurt Perez shortly thereafter with his left hook. Toward the end of the round, Mares impaired Perez after connecting with a right-left combination. Although Perez landed a number of damaging punches during the bout, it was quite clear Mares pulled away with the fight in the later rounds. Right on the money with the first fight and they will fight again.